For our first story we are diving deep into the heart of Texas to show you the Allen Eagle Escardille. 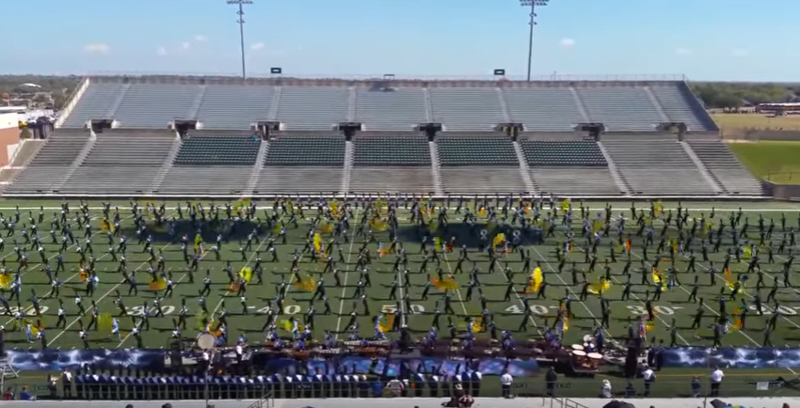 This high school marching band is not only the largest high school band in the country, they might just be the largest marching band in the world! The band has over 760 members, but around 640 actually march at halftime. It is actually insane to watch this band take the field. Their drill writer should conduct a master class in spacing and timing and should be awarded a medal for this work. On top of all of that, what really amazes us is the balance this band shows on the field. As you watch their performance listen to how clear and crisp each section is which is a direct result of both good musicianship and balance. Credit to the students and their directors. Enjoy this amazing high school band that is truly unmatched in the world. Their 2016 show is titled "Cyclone".